The Gonzervatory is now officially a reality. The day of the announcement, I was curious to see the feedback on Twitter. 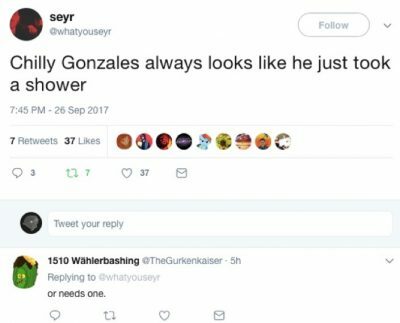 I couldn’t help but notice that the few dozen likes we had accrued were vastly outnumbered by my impulsive retweet of the statement “Chilly Gonzales always looks like he got out of the shower.” (hat tip to Twitter user @whatyouseyr). Unsurprisingly, snark travels faster than heart. At first I felt disappointed, and a little dirty. One might say I needed a shower. But wait…My bathrobe-plus-slicked-back-hair look is indeed my trademark, featured prominently in the Gonzervatory video. And this prompted a Twitter-perfect response that spread further than my initial, idealistic plea. If the music business is about branding now (as opposed to record sales), this random guy’s tweet represented a triumph of snarky marketing.#snarketing. And isn’t this the kind of thinking I want to share with my Gonzervatorians? Haven’t I consistently given advice to my musician friends to project a cartoon-character-esque visual identity? This retweet may be proof of the power of looking at yourself through the eyes of the audience. This is a power that can be used for good, a power that can be shared.